Do you need inspiration for Scorpio zodiac tattoos? With its abundance of symbolism and mythology, the eighth sign of the zodiac and your distinctive personality may create the perfect blend of skin and ink. If you were born between October 23rd and November 21st, you have something in common with some of the most powerful and charismatic people in the world. Five United States presidents were born under the Scorpio sign, which ties with Aquarius as the most common astrological sign of American presidents. Because of personality traits like determination, intuition, magnetism, and passion, Scorpios are well-suited to expressing themselves through body art. While charming the public with a polished image of self-control and dignity, Scorpios seethe with intensity and sexual magnetism. Such multi-faceted layers require expression and there's no better way for the Scorpio to quietly unleash her artistic side than with a well-placed tattoo. Scorpio is comprised of many elements from the mythological to the astrological. 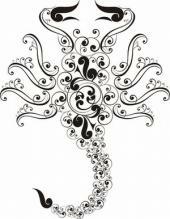 With such a rich background, ideas for Scorpio tattoos are almost unlimited. If you're still stuck for inspiration, take time to learn more about each aspect of the Scorpio sign. Scorpio's glyph represents the legs and tail of the scorpion symbol and looks like the letter "M" with a pointed tail curving upwards. Despite the good humor of most Scorpios, they can sting if their feelings are hurt or if they feel mistreated. The scorpion elements of the glyph support this personality trait while at the same time supporting the successful and upwardly mobile nature of the Scorpio. The latter association comes from the tail that forever points upward. The glyph makes an attractive tattoo and delivers a solid statement about the confidence of the person whose flesh it adorns. Redesign the glyph in your own way to get a unique and stylized result. Scorpions are beautiful and deadly, striking with confidence at their antagonists. Although they sound unpleasant, scorpions are symbolic of strength and power and make excellent tattoos whether based on the zodiac or based on a love for the creature. Unlike some of the other zodiac symbols, any representation of the scorpion works well as a tattoo. It can be beautiful and mystical or grotesque and frightening, but it always remains recognizable. All zodiac signs occupy a space in Greek and astrological mythology. There are several variations of Scorpio's tale but all of them claim a vengeful goddess summoned Scorpio to sting the giant, Orion, until he died. It's unclear what Orion did to inspire such wrath, but most of the myths indicate that it had something to do with his boastful nature and lack of respect for the gods. After the battle ended, Scorpio and Orion were placed in the night sky at a comfortable distance of 180° from one another in order to prevent any more trouble. This kind of mythology makes the perfect backdrop for a Scorpio zodiac tattoo. Use your imagination or design your own version from the ideas listed below. The slashing stinger piercing Orion's skin creates a vivid picture, especially if enhanced by shiny red drops of blood. Scorpio originates from the constellation, Scorpius. Why not check out some images of the constellation and add it to your design? If you're interested in a full back piece, you can immortalize Scorpio's entire story for the world to see in all the colors of the rainbow. The glyph overlaid with the Scorpion symbol looks great on shoulders, necks, or hips. Don't let tradition get in the way. Jazz up your ink by including some of Scorpio's more neglected properties. Scorpio is a water sign. Consider showcasing the dual nature of Scorpios with a desert scorpion cruising through the watery surf. The ruling planets for the Scorpio are Mars and Pluto. Use them as a background for your design. Scorpios love all things red. Incorporate the color of passion into your tattoo. If you prefer simplicity above all else, consider an elegant tattoo such as the word Scorpio in an easy flowing script. Both the symbol and the glyph work well for small tattoos and for large tattoos. It's easy to create a design you're comfortable with using all of Scorpio's elements. To get the perfect Scorpio zodiac tattoo design, consult with your tattoo artist before making a decision. Above all else, your tattoo should reflect your uniqueness as an individual.